Get ready for your first race... on a napkin! Race up to three of your friends in splitscreen, challenge a buddy across your network or try against up to four computer opponents. 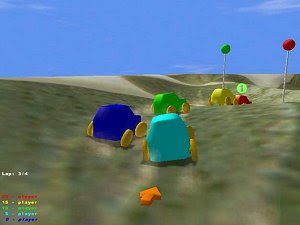 Choose from two gamemodes: checkpoint race [made with needles] and tag race. The game offers OpenGL rendered graphics with a cartoony look, featuring particle effects and realtime shadows.